However, the conversion of CO2 into useful fuels is a challenging problem in chemistry and chemical engineering. It takes energy to turn CO2 into carbon monoxide (CO) and CO into natural gas (methane) and liquid fuels such as gasoline. The good news is that methods using electrochemical cells to transform CO2 into CO could easily be powered by renewable energy from intermittent resources such as the Sun and the wind. Instead of adding more and more CO2 from fossil fuels to the atmosphere, people could recycle CO2 from burning fossil fuels using electrochemical cells and alleviate the progression of global warming. Fortunately, electrodes made of metals such as gold, silver, or bismuth can catalyze the transformation of CO2 to CO. Bismuth has advantages over other metals, including (1) working as well, if not better, than gold, (2) being readily available in large quantities because it is a by-product of lead mining, and (3) costing nearly 350 times less than gold per gram. Because of these advantages, bismuth metal is under consideration for CO2 conversion, but the molecular details of the process are not well understood. To gain a deeper insight into the process, the group recently began investigating the use of bismuth metal in CO2 conversion catalysis on the molecular level. What Thompson and his colleagues learned from studying their bismuth-CO2 cluster model system was that a CO2 molecule docked onto a negatively charged bismuth atom through the carbon atom. The chemical bond between the bismuth atom and the CO2 then allows an electron to spend about 65% of its time on the CO2 molecule. 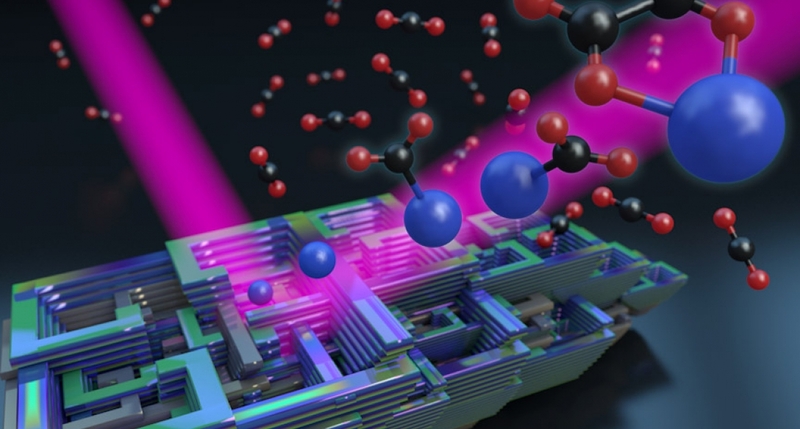 By the time the researchers positioned approximately four CO2 molecules around the bismuth–CO2 molecule, the extra electron was almost completely transferred to the attached CO2 molecule.